A gospel concert was held in Mbombela to pray for zero fatalities on the roads and to call for an end to gender based violence. The Mpumalanga government has raised concerns about the increasing number of road fatalities in the country. It has partnered with different stakeholders in raising awareness about road safety ahead of the Easter Holidays. Many lives have been lost due to road crashes and gender based violence. Religious leaders have partnered with government in an effort to end the scourge. “Many people are dying on the country’s roads, a lot is happening and we thought we should bring people to pray for safety on our roads. We are saying everyone must be responsible, whether he/she is driving, voting as we are going for the elections and also the issue of gender based violence is a huge problem,” says event organiser Sipho Makhabane. Government is optimistic that this initiative will yield positive results. “We welcome such an initiative because we have always been saying people, as government we are concerned about the road crashes, as we are going for the Easter holidays, we will be very visible on the roads,” says Mpumalanga MEC for Community Safety, Security and Liason Pat Ngomane. The initiative has also been welcomed by citizens of the province. “We need prayer in everything, in South Africa we do everything right. What is missing is just for us to invite God to be with us in every journey,” says one resident. “I decided to be here because this event raises awareness and also gives us an opportunity to see gospel artists performing here,” adds another resident. 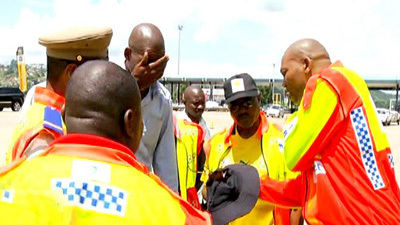 The provincial government is expected to roll out its Easter Weekend road safety campaign on Tuesday. The post Mbombela prays for road fatalities, gender based violence appeared first on SABC News – Breaking news, special reports, world, business, sport coverage of all South African current events. Africa's news leader..